Whether you have a question about wrenching or riding you should be able to find the answer on WhyBike.com. If not, drop me a line and I will try to figure it out for you. The motorcycle blogging community is adding new writers every month. 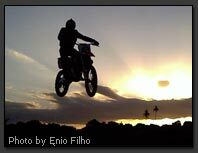 I have gathered feeds from a few more motorcycle bloggers to expand our aggregator. Check out what is making waves in the motorcycle world, from the people who ride cutting edge technology to those who are content in cruising and post a comment to leave your mark. Some people ask me why I ride a motorcycle and others are curious but too shy to ask. It is not something that can be conveyed through conversations at parties, nor to coworkers while waiting to send a fax. It is a lifestyle, a recreation and a religion. It inspires people to push themselves to the edge, while taking others far away. But this is just the tip of the iceberg. If you ask 10 riders why they bike you will get 10 different answers. You still won�t understand why they bike, until you do. I created this site out of frustration with the motorcycle sites out there. The forums where SPAM posts more than the users. The rants of elitists that care more about what you ride than how you ride. Sites where you have to pay to read a halfway decent article or links that have been dead for years left me unsatisfied. I don�t claim to be the best rider in the world or know all there is to know about motorcycles, but through your help commenting on the blogs, submitting articles, shooting videos and sending us your trip reports we can try to document why we bike, while helping out those just getting into motorcycling.